Automotive Artist Bruce Kaiser doesn't want to change the world. He just wants to create nice paintings. With a big fantasy, that's what he is doing. Automotive Artist Bruce Kaiser is well known for his automotive illustrations and artwork. Beside his excellent painting skills he is also restoring his own car collection doing most of the work himself. 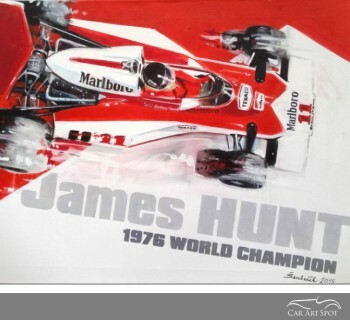 Another great artist in this series of Automotive Artist interviews. How did you become an automotive artist? Well, everybody probably says the same thing; I mean I’ve been drawing since I was probably 5 or 6 years old, drawing cars, airplanes, spaceships and anything like that. My dad had a repair shop when I was growing up; it’s actually still in the family to this day. That’s where I hung out. So I was always hanging around and drawing pictures of cars and stuff. I don’t know if I ever felt a calling to be an artist, I’m not one of those guys who wants to change the world, like my college classmates did, with my artwork, I don’t really care about that. I just want to create nice paintings that I'm happy with and hope people like them and hopefully make a living doing it. 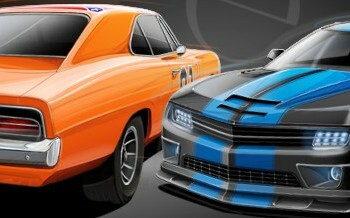 You combine the automotive art with your company Kaiser Illustration. 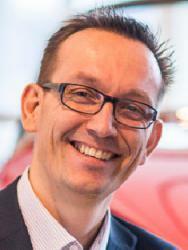 Do you design specifically for automotive clients, or just in general? Pretty much for automotive. I’ve been a graphic designer since I graduated from college in 1972, and my goal always was to do illustration and fine art, but I haven't been able to reach that point yet, where I have enough business or demand to do just illustration. But it was always my goal to be an illustrator, and fine artist. I do quite a bit of illustration, but it’s all driven by my clients, I do catalog covers, magazine ads and instruction sheets, as dry as that sounds, but I enjoy trying to get my client's message across and doing a good job. I enjoy the instruction sheet illustration because I've always loved good line art and trying to interpret or draw something so that people understand it better. What kind of stories do you want to tell us in your artwork? Well the main thing is I have these ideas, you know I try to recall things I remember as a kid. Even before I was driving, I used to ride my bike to an A&W drive-in restaurant near our house summer nights and hang out and watch the cars come in and get a soda or ice cream or something. My parents would give me money every night to get a milkshake because they thought I was too skinny! If you've ever seen the movie American Graffiti (one of my favorites), that's the image I have stuck in my head and I want to paint. American Graffiti is probably the clearest image of what I remember car stuff was like in the mid-60s, you know, and I remember that almost exactly, or like to think I do! When I got my license and started to drive, I used to go to places like that. Those pictures are kind of stuck in my head, although probably kind of optimized and fantasized a lot. I guess you always remember things better than they really were as you get older. For example, my paintings have all these pristine collectible muscle cars in them. When I was a kid; we all had ’55 Chevys and junkers. Cars in primer. I’ve often thought of doing a painting like that. The way it probably really was. People driving their father's station wagons, not everybody had muscle cars. I mean a few kids did, rich kids in high school that had new cars, I graduated from high school in 1969, right at the height of the muscle car thing, you know, so there was a few kids that had new Corvettes, Mustangs and Chevelles, but most of us just had beaters. So anyway, I try and paint that picture in my head all the time. All my ideas of what I want to do are driven by what I remember as a kid. So how do you start with that? I read that you do quite some research before you actually start painting? Well, normally something will just give me a thought, whether it’s a picture I’ve seen in a magazine, driving down the road and seeing, you know, cars in the drive-in or traffic or something will set an idea off. And I start sketching; I do a lot of thumbnails, tons of sketches. And when I get close to what I want, then I start going through my magazines. Over the years I’ve collected quite a swipe file of pictures I’ve torn out of magazines, plus photos I’ve taken myself at car shows. I take as many photos as I can for reference. I get a kick out of that, I mean it’s a good excuse to go through all my old pictures and magazines. That part probably takes too long, but I like to get things as accurate as I can. Then I’ll copy them, or, more and more now, I’ll scan them and kind of composite the scene together in Photoshop where I can tweak sizes and composition as much as I want. Then print that out and do line art, detailed drawings over the top of that, and finalize it. That’s kind of the way I work. Very interesting how you use the computer as well to make a kind of an assembly. I’ve spoken with several artists so far, almost all of them use the computer to help them, but each one of them has a different method, and this one I haven’t heard of before. It's probably come about because with my commercial work, I've just gotta get it done, you know, there’s a time constraint. I used to paint all my commercial stuff traditionally, but it just took too long and the client makes a change and then you gotta paint over it, so now 100% of my commercial stuff is all done on a Mac with Photoshop, and there’s another art program, Painter, I use that quite often. That way I can make changes, it’s faster, it’s safer. To me, my goal; I’m letting all my secrets out of the bag - my goal is to make what I do in Photoshop or Painter look exactly like what I do traditionally. The artworks that you have in your gallery, are some of them already made on the computer? No, everything that’s in the gallery is traditional or traditional tweaked or adjusted a little digitally. A lot of your artworks are around muscle cars, do you have one specific favorite model? When I was a kid I was very brand loyal, now looking back at it, I kind of love all of them. I kind of like the Chrysler products, the Mopars, and GTOs. Myself, I’ve always collected American Motors cars. I used to have an AMX and a SC/Rambler and now we’ve got a ’67 Rambler Rogue convertible and a ’66 Rambler Rogue hardtop 4-speed . And we’ve got a ’53 Nash Rambler that my dad had. That’s gonna be a hot rod. It’s the original car that your dad owned? It’s an original car, yeah, my dad bought it probably in the 80’s I think. And it’s really deteriorated, it had been left outside and it’s gonna need a lot of major work. It’s funny, I grew up with lots of different things, I mean there were hot rods in his shop which was an automatic transmission repair shop. That’s all he fixed was automatic transmissions, and in the 60’s they were just starting to show up in drag racing. So he kind of got a reputation of building a good race automatic transmission. So there were a few hot rods and drag cars in the shop. He hated it, he wanted nothing to do with them! He didn’t care about the cars, you know, it was his job, it was a business. But there was always some neat cars around, but he loved Porches, and we only had one. I got my driver’s permit on a 1952 356. And that’s what I learned to drive on. And then he had an older Mercedes. Now I have a ’68 Mercedes SL, 280 SL. That’s a project, I like restoring them. Yeah, I do my own sheet metal, welding and body work, paint and mechanical. And I have help from friends. At the start of our interview you had mentioned that you enjoyed reading my interview with Tom Fritz. Is there any specific artist that inspires you or that you learn from? Oh yeah. I study other artists to improve myself and aspire to. I look at some of these guys and I’m just in amazement. My favorite’s always been Syd Mead, you know he’s a conceptual artist that did the concept artwork for Blade Runner, Alien, 2010 and other movies. I like Tom Fritz and my other favorite is Ken Eberts. I like the way all of his automotive art, his paintings kind of tell a story, there’s a scene and people. 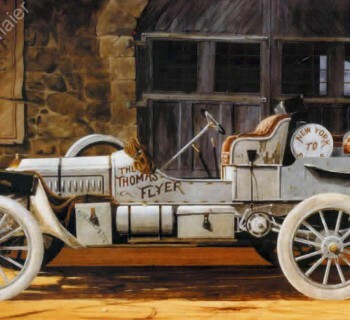 I like Tom Hale, he does tremendous watercolor automotive art. He’s more of a…he does like detail shots of a car, not the whole car. His colors are amazing! There’s some others, like Peter Helck, he’s like the grandfather of it all. So they’re kind of my favorites. Do you have any new artworks, any automotive art in the making at this moment? I do, yep. And it’s just, I start them and then something else will happen and I put them aside and it’s just getting back to them, but yes I do. How long does it take from the start to the finish? Traditionally, if I worked on it start to finish, it’d probably take me a month. One of the ones I’m really trying to get done, one of the prints that sold out the fastest was Woodward Avenue. That depicts the stretch of road in Detroit where everybody street raced in the ‘60s and early ‘70s. The car manufacturers did too as kind of clandestine test sessions I guess you want to call them, so that’s a real famous stretch of highway. The cops pretty much shut it down in the early ‘70s, but now it’s a huge car show once a year. There’s like millions of people there now, I believe it’s in August, Woodward Dream Cruise it’s called. Now it’s just a big rolling car show. So now I’m working on another painting along the same theme. I’d love to get into lots of stuff, I love Formula One, I’d love to get into that type of artwork, probably more the historical stuff, the Silver Arrow era of the 30s, you know, I’d love to be able to paint that. And more older drag racing art from the 60s. So, for now, how can customers’ best contact you? They should visit my website www.kaisercarart.com to see my automotive art and use the contact form.